On the 5th of November, 1605, a group of men attempted to carry out the 'gunpowder plot', a failed attempt to blow up the Houses of Parliament and kill King James the First. The man who was to light the barrels of gunpowder was named Guy Fawkes. The plan was discovered, however, when one of the conspirators sent a letter to his cousin warning him not to visit the Houses of Parliament. Fawkes was then caught just before lighting the fuse to the 36 barrels of gunpowder; enough evidence to lead to his conviction and execution. Today, the plot continues to be remembered through the use of fireworks, Bonfire parties and general celebrations, observed primarily in England, but also in places such as New Zealand. Four hundred years on, Guy Fawkes Day or Bonfire Night is really an excuse to have a firecracker of a party! Visit your local fire station or pub that celebrates bonfire night. This could consist of fireworks, a huge bonfire, and music. 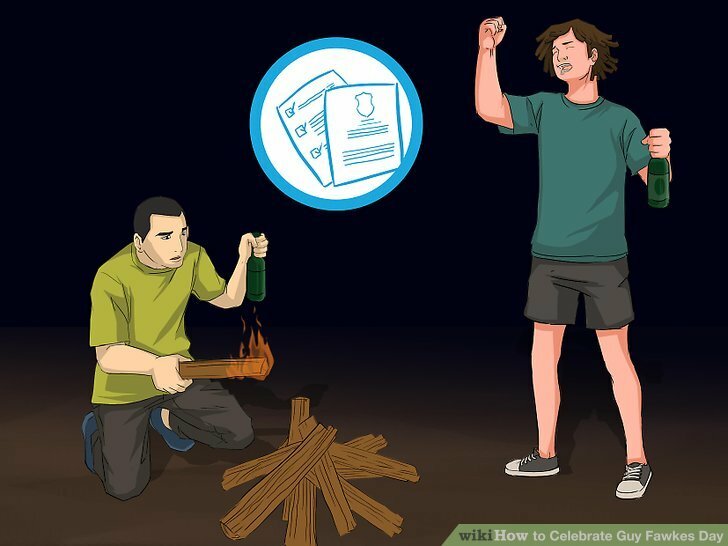 If it's a professionally organized event, it's likely that the festivities will be spectacular and you don't personally have to trouble yourself with tending a bonfire. 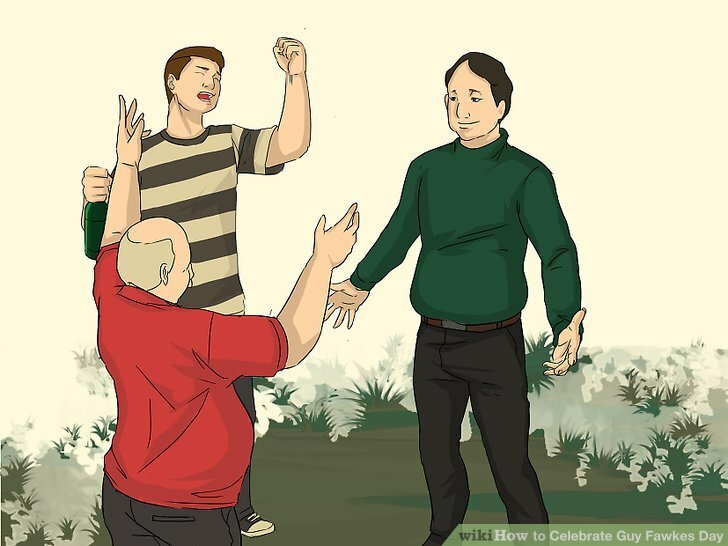 Make your own bonfire party. Find a sizable amount of land that is free of trees. Make certain it is not inhabited by people, or has stores or houses close by. You'll also need to check that the local regulations allow the creation of a bonfire in your chosen area. Check the weather forecast for the specific day of the bonfire. 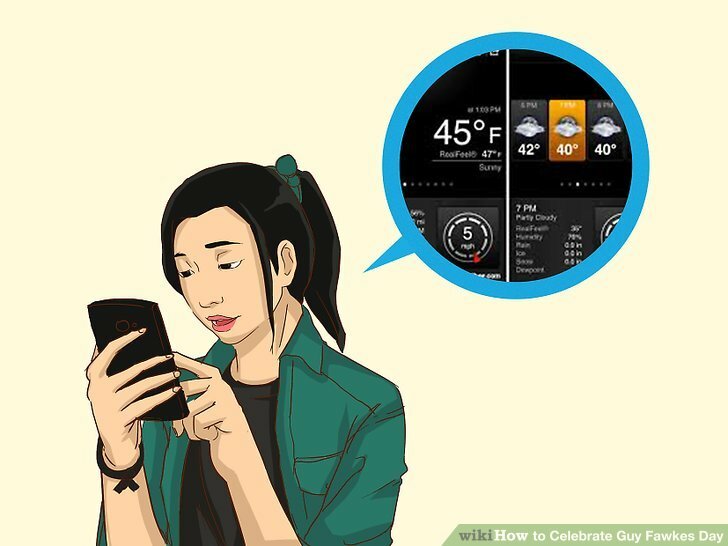 Accuweather is a great place to check UK weather so you can be sure the night will be rain free. Gather materials to burn. Twigs and dry leaves will keep a bonfire going for quite a while. 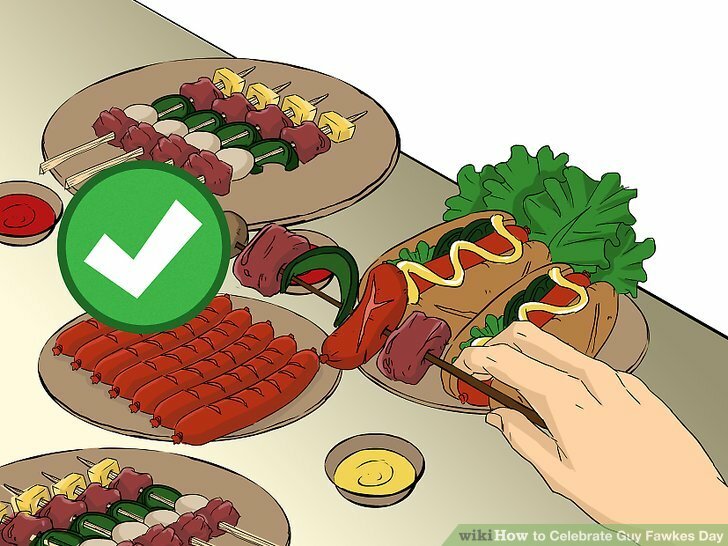 Invite friends and relatives and ask them to contribute materials to burn. Never ever use petrol to start the bonfire, death can, and does occur from this mistake each and every year. Petrol is a highly flammable and extremely dangerous liquid! Instead consider using fire lighting fluid or fire lighting blocks which are made from much safer solidified hexane. For safety precautions: Have a phone in hand at all times in case the bonfire gets out of hand. In the UK, dial '999' and request help from the local fire station. Fill two buckets of water and have them in handy. Powerful hosepipes are ideal. Purchase fireworks and sparklers. 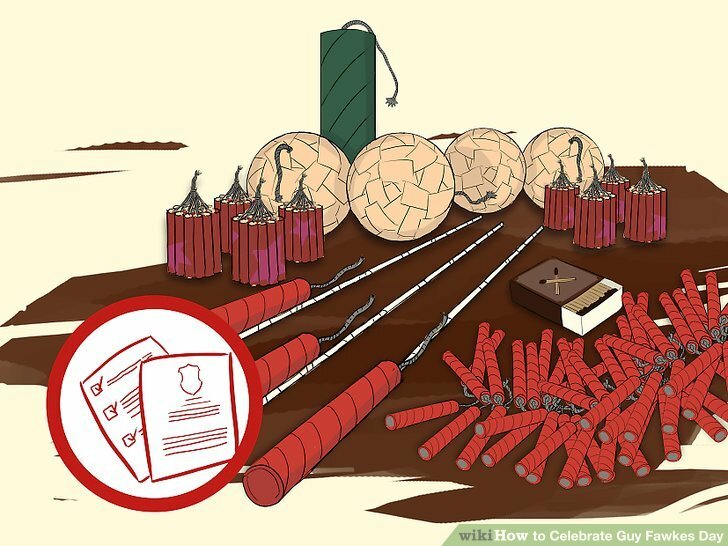 Use authorized suppliers and only purchase fireworks that are considered to be safe to use by individuals in a domestic context. If the fireworks require professional handlers, leave well alone. Get everything ready. About one hour before friends and relatives arrive, start the bonfire. 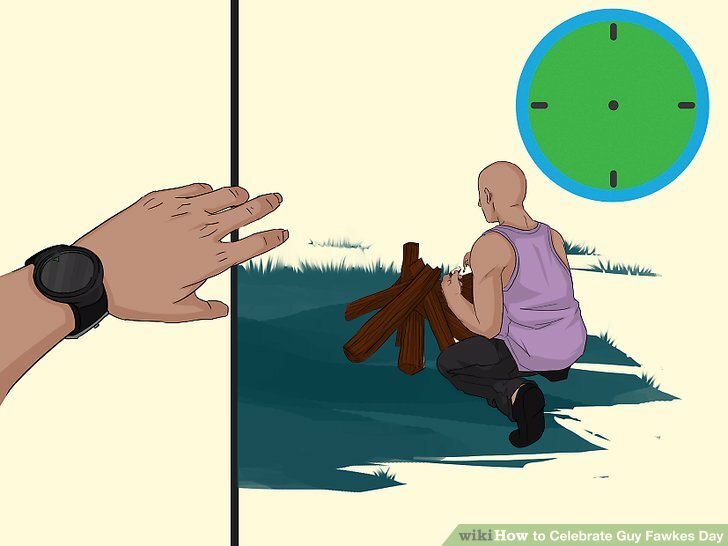 Do this by placing the fire lighting fluid in the center of the bonfire. Dried leaves, newspapers and small twigs made ideal kindling if placed loosely around the fluid. 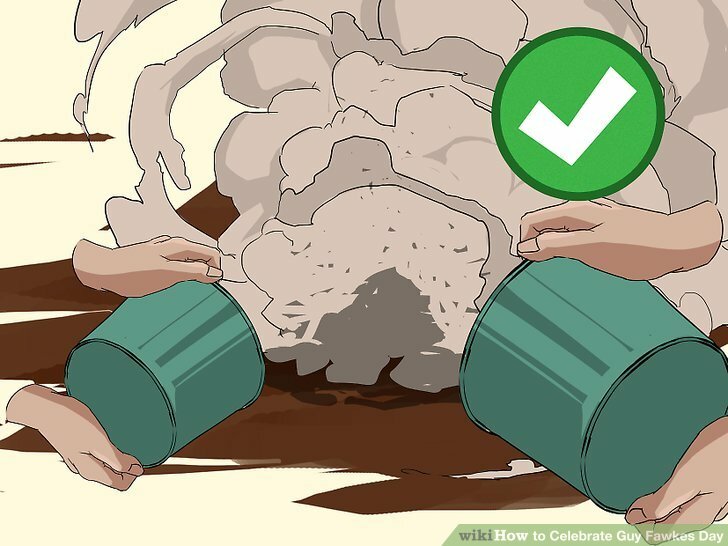 Light a match or two and place it into the fire lighting fluid. The hexane will light in a controlled manner and will cause the kindling to light. As the temperature increases the flames will very quickly turn from a small fire into a raging inferno. Make sure than you have enough firewood to maintain your bonfire for the duration of the party. As a rough guide the bonfire will burn a pile of wood equal to the size of the fire every hour. Set up a guest area, a safe distance from the bonfire. When they arrive offer them a drink and some refreshments. After a brief time of meeting and greeting, start lighting the fireworks. Follow the instructions provided with the fireworks and aim well away from people, animals and buildings; aim into the air. 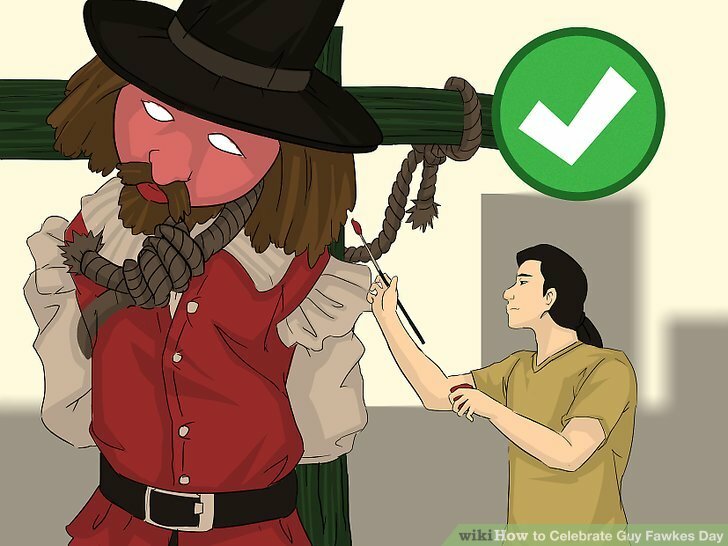 Make an effigy of Guy Fawkes and attach it to a post outdoors. 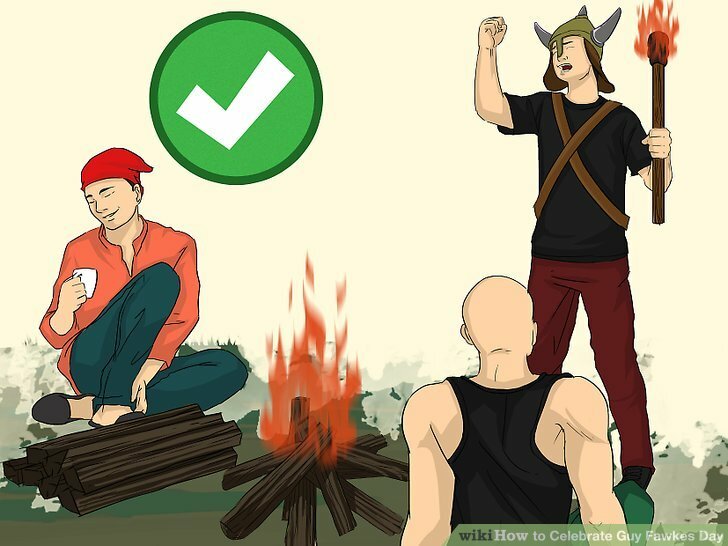 As with the bonfire, it needs to be somewhere that is free of vegetation or other flammable objects and should have a good area around it that is clear of any objects. Make sure that it's legal to burn things in your area. Call your local police station to confirm before the burn. Burn the effigy on the bonfire. 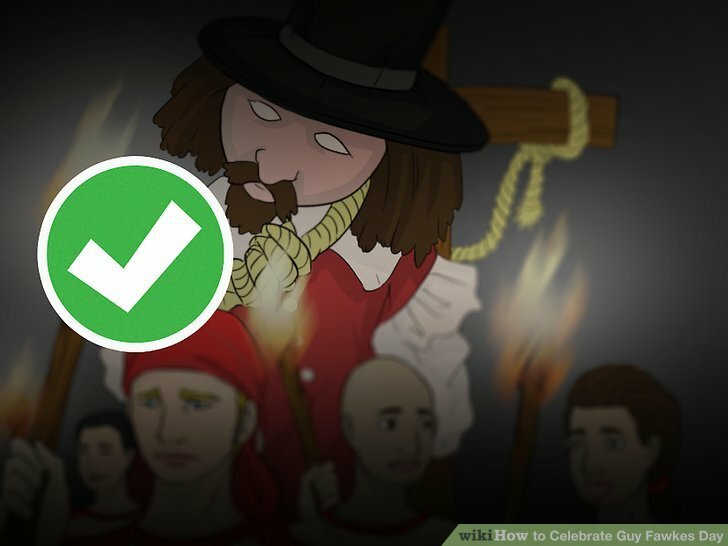 You can also sing the popular rhythm Remember Remember the Fifth of November. (The second verse is usually omitted). Then we'll say "Ol' Pope is dead." 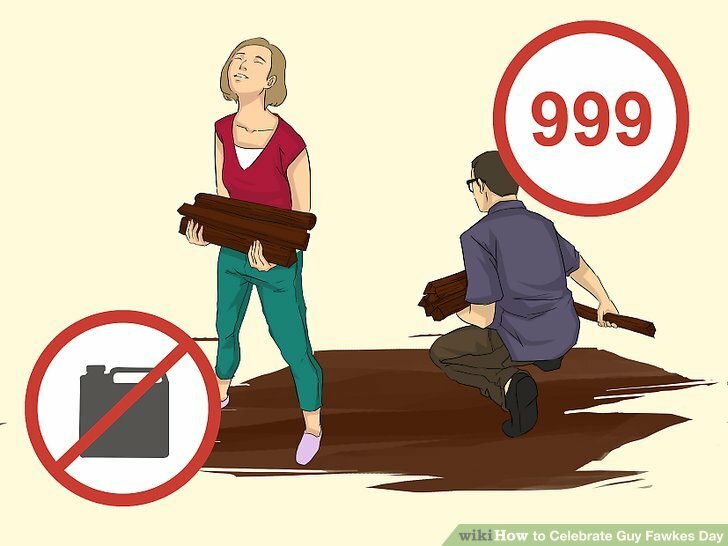 Throw water on the burnt effigy to ensure that there are no embers left to float off and start a spot fire. Dispose of the ashes appropriately. 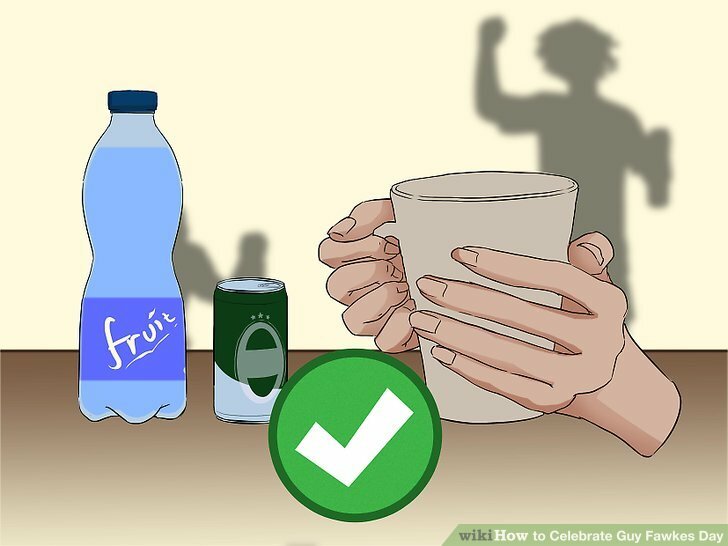 Provide some non-alcoholic beverages. While no doubt the beer will be flowing, not everyone will want beer all evening. Some hot chocolate, warm fruit drinks and other wintery drinks will be a good choice to keep everyone warm and toasty. 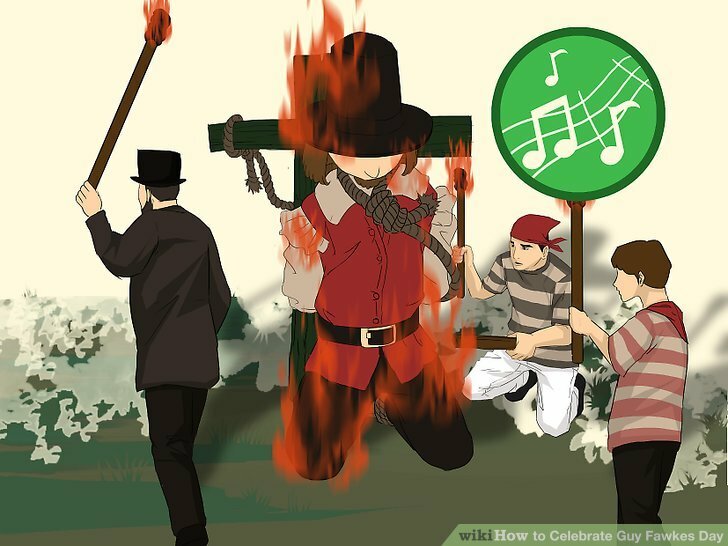 This occasion is known less as "Guy Fawkes Day/Night", and more as "Bonfire Night". The terms are interchangeable but some may prefer one over the other. Stay at least eight meters away from the fireworks or you could badly injure yourself. Watch the movie V for Vendetta (Warner Bros.), where Guy Fawkes and revolution are central themes. Don't forget to check when you are making a bonfire that there are no hedgehogs among the logs. It may be illegal to set off personal fireworks in your area. Check with the local authorities first. If your fire looks as if it may spiral out of control, dial 999/911 immediately. It is a lot easier for the fire brigade to put out a big bonfire than a house! Fireworks are dangerous. Follow the instructions without deviation and if you're unsure, either ask the retailer for advice or do not use them. Use caution when handling fire.